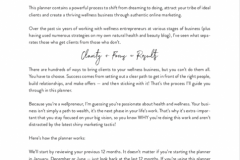 The Wellpreneur Planner is a marketing workbook and yearly planner, especially for wellness entrepreneurs who want to grow their businesses online. If you sell products or services in wellness, nutrition, fitness or holistic health, and you want to reach more clients through online marketing, this planner will help! No need to wait until January– start this planner any time, following the step-by-step process to plan the next 12 months. Then use the monthly planning pages to track your actions, wins, lessons learned, and results for each month. Reconnect with your business dreams and ideal lifestyle. 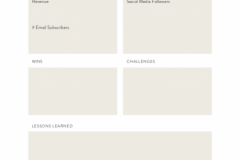 Uncover the lessons from the wins and challenges of last year. Setup the system to create organic growth in your business. Create an editorial calendar, so you know exactly what content to create and how often. 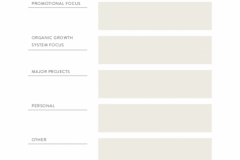 Plan the big picture rhythm of your year, plus a granular weekly schedule to get it all done. Capture key metrics to watch your monthly growth. Used alone, or as a companion to Wellpreneur, this planner will be with you all year to track your progress, reach your goals, and grow your wellness business. Get ready for your most incredible year of business yet! Available as a print book on Amazon.